Mill-Rose original Aluminum Oxide mesh for copper tube cleaning. A fully waterproof product made with open nylon fabric, Phenolic resin adhesive, which makes it waterproof, and rugged aluminum oxide. 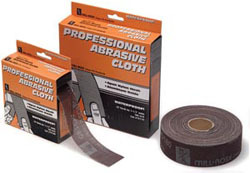 Coated on both sides of the nylon fabric to produce a long-lasting sharp cutting product. If this material becomes coated (loaded) with copper, brass or other non-ferrous or plastic residue, simply rinse in water or tap against a hard surface to clean. 70090 1-1/2" x 5 Yards 180 AO / 24 24 8.0 lbs. 70100 1-1/2" x 10 Yards 180 AO / 24 24 14.0 lbs. 70110 1-1/2" x 25 Yards 180 AO / 24 20 30.0 lbs.